Because it could be a signal that some living process is at work. And even we non-scientists have wondered at some point if the only life in the Solar System, or maybe in the entire Universe, is confined here on Earth. Methane doesn’t stick around for long. Once released into the atmosphere, it can be quickly destroyed by natural atmospheric processes. So any methane detected in Mars’ atmosphere means it must have been released recently, although it could have been produced millions, even billions of years ago, and lay trapped in underground rock formations. On Earth, most methane is produced by living creatures; microorganisms in sedimentary strata, or in the guts of ruminants, for example. Some of it is produced through abiotic or non-living processes, but finding methane at Mars is still, at least potentially, a big deal. Now, the European Space Agency, who operate the Mars Express Orbiter, have gone back over the data from June 15th 2013, when Curiosity detected a methane spike, and they’ve found something. The Planetary Fourier Spectrometer (PFS) on-board the MEO detected methane at the same location that Curiosity did, only one day later. 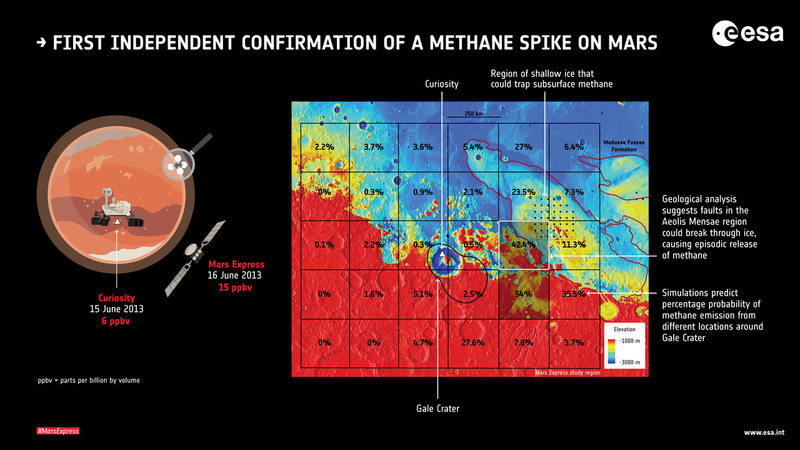 This is the first time that a Curiosity methane spike has been backed up by other, independent observations. These results are presented in a new paper published April 1st in Nature Geoscience. The results from MEO are part of a new method of analyzing data from its spectrometer. The technique collects several hundred measurements over one area over a short period of time. The team behind the results also developed a new way to analyze the data. “In general we did not detect any methane, aside from one definite detection of about 15 parts per billion by volume of methane in the atmosphere, which turned out to be a day after Curiosity reported a spike of about six parts per billion,” says Marco Giuranna from the National Institute for Astrophysics – Institute for Space Astrophysics and Planetology in Rome, Italy, the principal investigator for the PFS experiment, and lead author of the paper reporting the results in Nature Geoscience. 15 parts per billion is not a huge amount. But it’s still significant. “Although parts per billion in general means a relatively small amount, it is quite remarkable for Mars – our measurement corresponds to an average of about 46 tonnes of methane that was present in the area of 49 000 square kilometres observed from our orbit,” said Giuranna in a press release. There’s another correlation supporting this confirmation. Ten other observations by the Mars Express orbiter’s spectrometer showed no methane, corresponding with a time period when Curiosity showed low measurements, too. So where did it come from? Initially, the prevailing wind at Curiosity’s location in Gale Crater came from the North. Scientists thought that the methane came from the inside the crater itself, carried to Curiosity by the wind. Now, that doesn’t seem as likely. When talking about the source in this study, they’re not talking about whether its an abiotic (non-living) or a biological source. They’re talking only about the location of the methane release. In the graphic above, scientists with the Royal Belgian Institute for Space Aeronomy in Brussels, who are collaborators on the study, divided the area around Gale Crater into a grid. For each square, they used computer simulations to generate one million emission scenarios. The simulations used the measured methane, atmospheric circulation patterns, and methane release characteristics based on the phenomenon called ‘gas seepage.’ Gas seepage is when trapped methane is released from underground formations, usually due to tectonic activity. The percentages reflect the likelihood of the methane originating in each grid square. 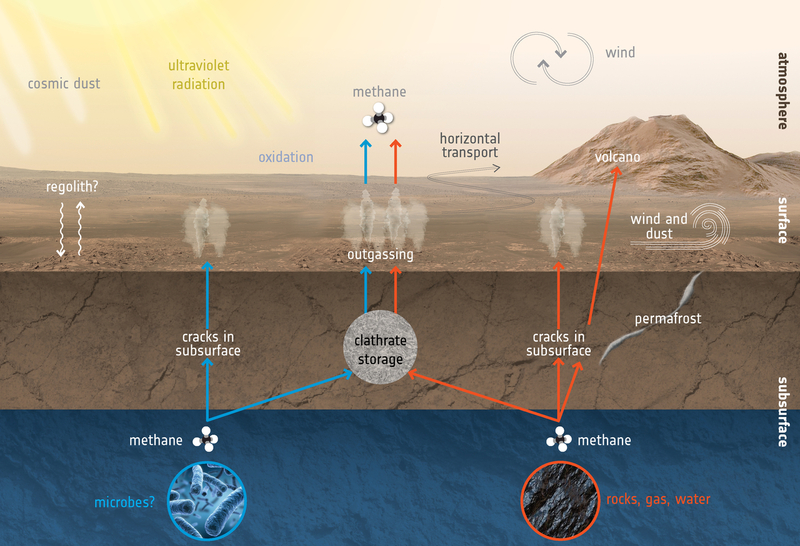 Methane on Mars is still a puzzle. But the pieces are starting to fit together. Now that another spacecraft, the Trace Gas Orbiter (TGO) is at Mars, we can expect more of the puzzle to be filled in. TGO is a joint mission between the European Space Agency and Roscosmos. It will make the most detailed analysis yet of Mars’ atmosphere. It arrived at Mars and started working in 2016, but only recently started scanning for methane. As for the source of the methane on Mars, that’ll have to wait. We just don’t know yet how it was produced, and whether living organisms are responsible or not. We are watching the death of a planet on Mars. Of course signs of life are all over the place. New life won’t be starting anywhere. The planet is dead. If we find life, we won’t be seeing the progenitor of life. We’ll be seeing the end of life. A corpse gives off methane as it sits and decays. Guess what? Planets do too. Previous PostPrevious The Starhops Have Begun!